There's nothing cheesy about this slot, well, apart from the whole theme. 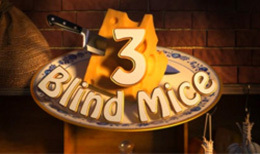 'Three Blind Mice is a brilliantly entertaining 5 reel game with 20 paylines. The main game is features. Wilds, Sticky Wilds, Expanding wilds with re-spin. There are also several interactive bonus games where players can pick objects, whack a mouse and Bonus wheel of fortune that's sets you of on a journey to potentially big wins.